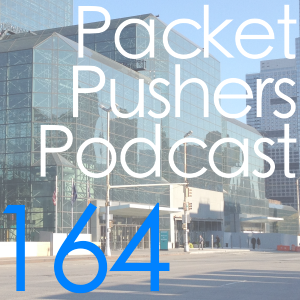 On this Packet Pushers podcast, hosts Ethan Banks and Greg Ferro are joined by Petr Lapukhov for a discussion about his IETF draft on BGP SDN, co-authored with Edet Nkposong. Guests Russ White and Ivan Pepelnjak also join in the discussion, quizzing Petr about the details of the draft and how implementation has worked out thus far in real life. For those that don’t know, Petr is a former CCIE instructor and CCDE and is part of the Microsoft Bing team. Russ is a long-time CiscoPress author currently sharing his knowledge with customers at VCE. Ivan is a grumpy old network engineer who’s written several books, consults on large and interesting networking projects, and is the man behind ipspace.net, one of the most well-regarded networking blogs today. The discussion in this show revolves around using BGP as a control-plane protocol alternative to something like OpenFlow to accomplish a sort of traffic engineering in the data center. The concept is to let iBGP do what it does naturally in the data center to program route tables. A controller learns the topology and can program routing exceptions for purposes of leveling out network hot spots or bleeding traffic down from specific nodes. Making the most of a well-understood protocol like BGP has simplicity and relative ease of implementation in its favor. 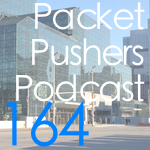 As we roll through this show, we also get into some of the network and application design challenges facing search engines. That makes for an interesting several minutes of getting to watch how Google and Bing make the sausage.